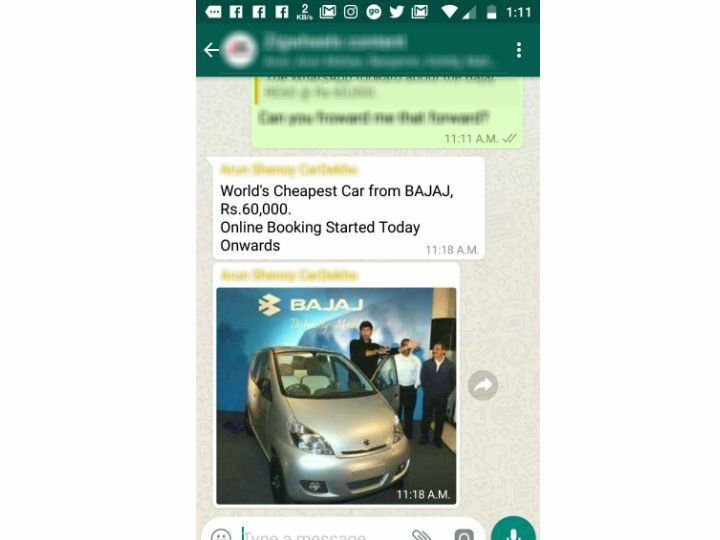 Some of you might have noticed a sudden spurt of WhatsApp forwards and videos on YouTube claiming that Bajaj has launched the 'World's Cheapest Car, Rs 60,000' and that 'Online Booking Started Today Onwards'. Please be aware that these messages and videos were started by trolls and are being spread by unsuspecting (and irresponsible?) people. The Bajaj Qute, earlier known as the RE60, is not on sale in India currently, and will not be on sale till some cases filed against its sale are dealt with in the Supreme Court of India. The Bajaj Qute is a quadricycle, a new class of vehicles in India, which looks like a car but is not a car. These can be 3/3.7-metre long, weigh 450kg/550kg, carry four passengers (including the driver) or 500kg of cargo depending on the type of commercial application. Quadricycles also have a power limit of 20PS and a limited top speed of 70kmph. The Qute began life as a collaboration between Bajaj Auto and Renault in the form of the Ultra Low Cost (ULC) car project back in 2008, which aimed to create a car that would cost around Rs 1 lakh. The project resulted in a concept car which was showcased at the 2008 Auto Expo, the photos of which are being used in the latest troll posts/videos about the Bajaj Qute. When Renault pulled out of the project, Bajaj decided to continue working on it independently. The result of Bajaj's work was first shown as the RE60 in 2012 - the company claimed a mileage of 35kmpl. What followed was a prolonged battle to make the RE60 road-legal in India. Competitors claimed that the RE60 could not be sold in India because it did not qualify as a car. Bajaj worked with the Government of India to create a new class of vehicles in India, the Quadricycle, to legalise such ultra-small, low-cost modes of transport. Bajaj rebadged the RE60 as the Qute and unveiled it in 2015, with all units destined for export to 16 countries including Turkey and Sri Lanka. A number of PILs filed in the Supreme Court currently prevent Bajaj from selling the Qute in India, and a verdict is not expected anytime soon. As for the Rs 60,000 price, it is completely unrealistic. The car was never conceived to cost less than Rs 1 lakh, and that was back in 2008. Right now the base price of the Qute headed for export is 2000 USD, or about Rs 1.28 lakh which is more than double the price mentioned. Share your experiences with Qute (RE60)? Confused about Bajaj Qute (RE60)?